For some designers this season, playing it safe and retail-friendly meant going back to what people know and like them for, while for others, this meant straying away from such, probably because their label's aesthetic is intimidating to try and apply every season. 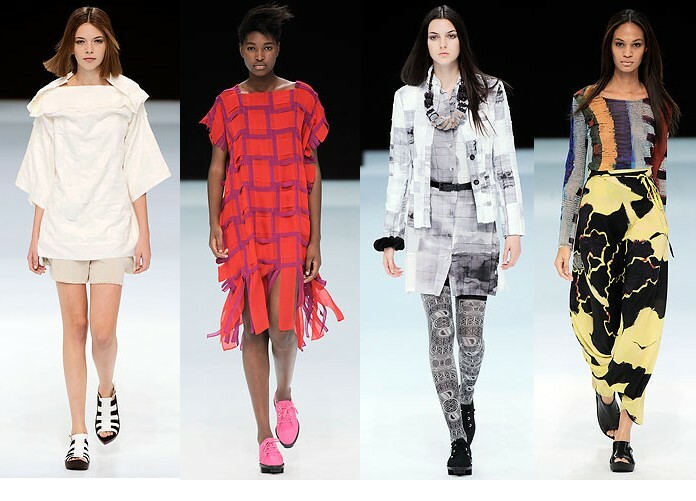 This season, the Issey Miyake collection by Dai Fujiwara was inspired by traditional clothing from all over the world. There wasn't much concept other than that, which is strange, considering the label's and Miyake's own history. Perhaps Fujiwara is of the playing-it-safe group that is intimidated by the label's aesthetic, and doesn't want to touch what it is mostly known for: philosophical ways of exploring clothing. Bummer. The thing is, most people that want to buy Issey Miyake want to buy pieces that are very distinctly Issey Miyake, and not what you can find done by other designers. If I look at this collection long and hard enough I can probably come up with something real deep about it, but it is, for the most part, just great to look at, with interesting -- but surely not thought-provoking -- inspiration. It was a bit like the Olympics, bringing together all different corners of the world and traditions, which I do think is a nice idea. I want to like the collection a lot, because it's very pleasing to the eye, and I am in love with the styling. And if I imagine that it is another label whose aesthetic is based on just the visual aspect of design, I do like it a lot, as the kind of collection I write about in a hyper voice while overusing the word "awesome." But looking at the slideshow pictures from the show, something did feel off. I think that when it came to drawing inspiration, Fujiwara made the mistake of looking further to other roots, and not deeper into his label's own. And that, I think, is what felt so off. On an unrelated note, I predict this will make magazines talk about "Tribal!" prints even MORE and some editorial will use one of these webby knit things with the giant pink mesh poncho at Y-3 and/or bodysuits from Mark Fast.